How does businesses communicate to the customer their product? Most would say through the various channels such as T.V., radio, newspaper, social media, etc. and all are correct. But what is the message that they want to convey for their benefit and how is it developed? This is where Marketing comes into play. Many businesses spend millions of dollars in research and development to create brand equity. The task is not easy, businesses must develop a marketing plan for their product and eventually create their logo, slogan, and promotions to attract customers. I want to give more emphasis on business slogans as is what most customers remember when a company is mention. The slogan does not only represent the company but is also the message that businesses want the customer to remember. Such as Home Depot, “More saving. More doing.”, choosing effective slogans that relate directly to customer satisfaction is key. Ultimately, no one buys something if it does not satisfy a need or want. Effective slogans draw attention to the business and their products. This marketing technique is very important and seen with most major corporations in the world. Slogans are so important that they are utilized in the business’s commercial, apparel, billboards, videos, business cards, and anything else that they may use for advertisement. Now, can you think of different companies and see if you remember their slogan? Wal-Mart, Nike, Red Bull, McDonalds, Skittles, MasterCard, etc. If you could recall the company’s slogan can you think of why it became important to you as a customer? If you were to start your own business think of how important it is to develop an effective slogan. Remember that your slogan should be memorable by customers, it should define a benefit, and differentiate you from competitors. While there are many more key factors in a business always remember that your slogan will be something that your customers will remember, and it will carry on for years. By: Emir Gonzalez, Business Major – IUPUC. Blogs, Blogs, Blogs… They are everywhere and you may not even realize it. Blogs are the marketing tool of the time and blogs are giving newspapers and radio advertising a serious run for their money. In order for a company to effectively use blogs as a marketing tool, a company has to have a solid understanding of what social media means for businesses today and how they can utilize the social media world and blogging to benefit their long term strategy. Blogging has broken out from the conventional blog hosting sites and is now on all of our social media platforms. If the criteria for a blog is: regularly updated articles, one or more authors and typically focused content written in an informal or conversational style then blogs populate Facebook, Instagram, Snapchat, Pintrest and many other platforms. When you like and share an article or a post you are essentially marketing for someone and perpetuating a blog. Today, social media and the internet allow companies to have direct relationships with their consumers that were not possible in the past. Companies can now interact and engage easily with their consumers just as consumers can now easily engage with their favorite companies. This dynamic has some companies scratching their heads while it has other forward thinking companies developing strategies around it. Two forward thinking companies I think that are effectively utilizing blogs as a marketing tool are Coca-cola and Gary Vaynerchuk with Vaynermedia. Both have set up an amazing web of blogs and social media content that keeps the attention of their consumers and maximizes interaction and impact. Both companies realize that the use of blogs as a marketing tool is a long play. The effectiveness of blogs relies more on the quality of its content and the relational depth a company has with its readers than the number of followers alone. A good blog should not push sales, it should give value to the reader. Nobody wants to read blogs that are always pitching a sell to them. A reader wants value from the content in the form of entertainment or knowledge. Essentially a blog is a marketing expense that is used to give your customers value in the form of entertainment or knowledge. That sounds like an awful play but if you consider the blog as a relational investment in regards to the integrity of your consumer base then it makes sense. Effective blogs are relationship and trust builders. Gary Vaynerchuk once said, “If you give more than you take then you have leverage for life”. Coca-cola has positioned their blogs as a form of engagement and interaction while providing stories and product updates through their blog “Unbottled”. The content is not overwhelming or pushy and articles can be easily searched and found through filtering. Coca-cola wants to reach and keep the attention of as many consumers as possible in order to fabricate a lasting loyalty from them. Their focus is rooted in retention through attention and Coca-cola quickly cycles numerous pieces of content that are broadly appealing and shareable. Gary Vaynerchuk is the CEO of Vaynermedia, a 600 employee media and strategy company that boasted over $100 million in revenue last year. He is a pioneer in the digital and social media world and an incredible entrepreneur to say the least. Gary started his career after he graduated college in 1999. He took over operations at his father’s wine company and increased the annual revenue from $3 million to $60 million annually through the use of an incredibly effective e-commerce and e-mail marketing program. He started one of the first online video blogs in 2006 called Wine Library and in 2009 he and his brother started Vaynermedia. Gary hustled his way to the ability to put yourself in other people’s shoes and see what they want is the greatest gift anyone can have. With that gift all you have to do is deliver and Gary understands that today’s generations require interaction, online relationships and above all else… attention. The social media climate is driven by attention. That is why we have like buttons and share buttons. It is why we post pictures and stories for people to read and tell us how great our lives are. We crave attention and Gary is a deliverer of attention, value and motivation. Gary also blogs to maintain his personal brand as an industry leader. His blogs means more followers which result in credibility. Credibility sells books and authors get paid to speak. That type of notoriety can lead a company such as Vaynermedia which sells various media products and provides services such as social strategy and social media management to many fortune 500 companies. As you can see blogs allow a company to be more up close and personal with their consumers than ever before. If a company understands what they want to achieve through blogging they can begin to develop a strategic plan and begin the long game strategy. The first step is to create shareable content that readers will find value in. Then listen and be empathetic to their needs and deliver to those needs. Interact and keep their attention and the number of followers will increase. If a company can remain consistent and present, then they will gain the trust and loyalty of their followers and that is the goal of any company or blogger. Driving value into a business is what every business owner and/or leader needs to accomplish. Using Twitter, along with a common-sense marketing plan, can drive value to any business. Twitter is currently being used effectively by various sizes and types of businesses to connect with customers, build brand, advertise and increase sales – and you can too. As with any type of marketing or communications (marComm), using Twitter should be done with planning and rigor. However, it can still be fun, creative and impulsive. Using the following elements in this simple equation will provide a solid foundation and set you free to tweet. I’m not a math major, so the equation might not make perfect sense. However, let’s focus on the elements which make the equation work. This article will help you understand the basics of each element and how they drive value into your business. Plan: As part of your marComm plan, develop a high-level plan that drives goals and provides a strategy for communicating with Twitter. Simply state a goal to gain 500 Twitter followers and convert 5% of them monthly is a good start. You will also need to develop a tactical plan of weekly and daily Twitter activity of when you will communicate and when you will market to your followers. Tools like HootSuite can help schedule tweets so you can keep working! Content: Any marComm plan is only as strong as the content that you deliver. Not everyone can film, edit and soundtrack a video that rivals professionally produced media, but you can still produce quality content that is in line with your followers’ expectations. Good content can be as simple as your opinions and thoughts (based on your plan) or as complex as multiple media streams (photo, video, animation, illustration). Following industry thought leaders and reTweeting (RT) their comments, as well as your replies, is another good way to provide valuable content to your followers. Brand: Brand is simply a relationship that is based on a set of expectations that drive a consumer’s decision to choose one product or service over others with similar features and benefits. So, like any other relationship you have via social media, your Twitter followers should easily get an idea of ‘Who you are’ and ‘What you do’ so they can begin to understand ‘What you can do together’ and ultimately, make a purchasing decision. Businesses that do not establish and reinforce their brand in marketing and communications, usually struggle to keep long-term followers. Establishing a strong brand is essential to drive value to your business. Consistency: Before stepping too far out into the social world, you need a consistent voice and brand personality. The best way to develop your voice is to practice tweeting in smaller social venues (church, alumni group, friends, etc) not associated with your industry. Driving consistency doesn’t mean all your content is similar, but rather it feels like it is coming from the same entity (person, business, organization, etc). Without consistency, your followers may feel as though they are developing a relationship with someone who has multiple personalities. Followers: Quality trumps the quantity of followers every time. In Twitter, find people who post frequently in your industry, then follow and re-tweet (RT) their content if it fits inside your content strategy. Then, build a relationship with these ‘thought leaders’ and drive value back to them. You can also use Twitter’s search function to find people and businesses in your industry. When they show up multiple times, follow them. To keep a high-functioning list, block and remove all spammers and content that is not ‘on your brand’. Value: Follow your plan and deliver good content. Stay on brand and be consistent. Follow the right people and build your list. Including these elements will drive value to your business and leave more time for focusing on your real job. Changing colors isn’t a new procedure for M&M’s. They changed their tan M&M to blue back in 1995. They had the choice of blue, pink, or purple and had to call a 1-800-FUN-COLOR hotline to place their vote. What about internet consensus? It wasn’t until 2002 that M&M decided to introduce another new color, but this time voting was done via the internet. The choices were pink, purple or aqua. There were advertisements abroad, all over the world. Consumers were invited to go online to M&M Global Vote and vote for the next color. M&M marketed this new campaign to all sorts of media. In one particular instance M&M had put a voting poll on the AOL homepage, and in a single day registered over 600,000 votes! After the time was up, the internet consensus determined that purple was to be the new M&M color. Mass Animation, a computer graphics company out of California, teamed up with Facebook to create an interactive consensus with Facebook users. People had the option to download software that had unfinished clips of a possible story line and make it their own. They then submitted their short film layout and people could then vote on them. The winning submission with the most votes won a Dell XPS System, and every week the submission with the most votes won $500 per shot. Once the polls were closed, Mass Animation studios then finished the short film and Sony then showed the short film on the big screen with Planet 51. The internet consensus produced a high quality and entertaining short film. Pepsi knew it had a fan craze base with Mountain Dew products and wanted to provide tasty options to its many loving fans. They provided the simplest solution: give them what they want! Pepsi created a very comprehensive poll method allowing their fans to choose everything about the new product: the flavor, color, name, label design and fans even had the option to choose which campaign companies would make the new commercials. That’s not all! 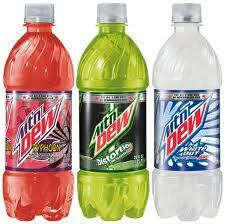 Then they finally had the option to choose one of the three drinks they created to be the new mountain dew product. Geniuses. With the knowledge that internet consensus is successful and can provide profitable data, how do we implement that at IUPUC? It would be simple for IUPUC to question their students with an on screen poll installed on all the lab computers. A lot of people are investing in smart phones and use an IU mobile app. IUPUC could use that app to retrieve poll answers. So what kind of information would IUPUC receive through internet consensus? IUPUC could ask the students and teachers about what kind of new lunch item they would like to see at the café. Ask the students what class they would really be interested in taking that isn’t provided. Come up with community volunteer ideas and let the students decide on which one they would like to participate in. Find out what pressing topics we are interested in and give those majoring in journalism an opportunity to write about what we want to know more about. Any information that IUPUC needs to come to conclusions or for research can be done through internet consensus via webpages, mobile apps, Facebook, Twitter and more. Overview – In the business world, the words “group” and “team” seem interchangeable, but smart managers realize there are subtle – but important – differences. Recognizing these differences early on will help small business managers to more effectively lead people to achieve their organizational goals. What is a Group? – A group in the workplace is usually comprised of three or more people who recognize themselves as a distinct unit or department, but who actually work independent of each other to achieve their organizational goals. For example, a small business may have a client services group, but one person may focus on local clients, one person may focus on regional clients and a third person may assist both of those individuals. Also, groups tend to be permanent fixtures with ongoing goals or responsibilities. What is a Team? – A team is comprised of three or more people who may come from different departments within a business, but they collaborate together over time to achieve some set purpose, goal or project. For instance, before a small business creates a new product, it may organize a team comprised of people from all departments – engineering, finance, legal, marketing, etc. – to consider all aspects of the potential new product in order to avoid costly surprises down the road. With a team, individuals recognize the expertise and talents of others needed to achieve the team’s goal. Additionally, teams are often formed for temporary assignments with one specific goal, focus or outcome in mind. Why Form Groups? – Managers recognized many years ago that two heads are better than one, thus small businesses have turned to groups or departments for many reasons. With group work, members have a shared knowledge of the group’s objectives, but specific tasks or responsibilities are assigned to different individuals. By separating work into groups – such as one devoted to marketing, one devoted to accounting, etc. – individuals within those groups are able to maximize their expertise on a long-term basis. Why Form Teams? – Businesses form teams usually to tackle a specific – and usually temporary – goal or project with the intent of leveraging the collective expertise of a variety of people. Because experts from various departments are involved, teams can avoid potential problems early on in a project. For instance, a team of only engineers may create a new product but may not understand whether it’s affordable until someone with a finance background completes a “return on investment” or ROI analysis on its feasibility. Having a finance member involved on the team from the beginning will help the engineers to create an affordable product in the first place, saving time and resources. Teams can be very productive because involving people with different talents provides teams with increased opportunities to work more efficiently.